TYPO TALK in Mainz in March — Blog — TypeOff. 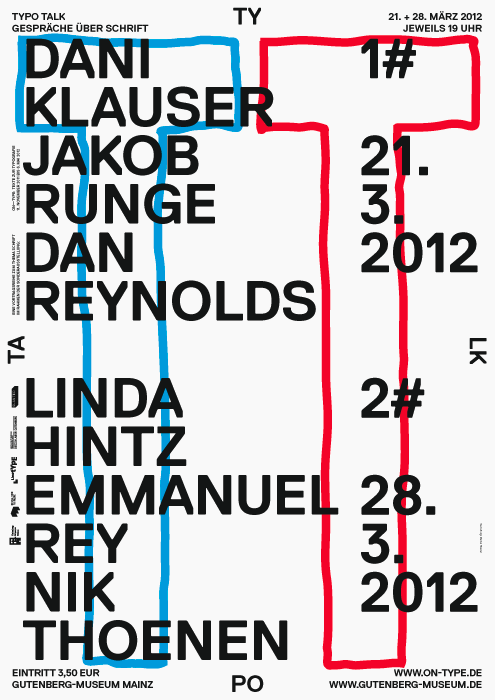 As part of their ON-TYPE exhibition, the Gutenberg-Museum in Mainz will hold a two-day lecture series entitled TYPO TALK on March 21 and 28, 2012. I’ve been invited as one of three speakers to present on the 21st. The series organizer, Marcel Häusler shared some information with today that I am pleased to translate into English for TypeOff. readers. Unfortunately, I will only be in Mainz for the first evening – on March 21st – but both dates are sure to prove interesting. These days, there are more typefaces available than ever before. More and more typefaces are being designed every day. The TYPO TALK shines a light on the world of type design. The lecture series will help illustrate the work of type designers and their processes, all the way from the creation of new typeface concepts to their final uses on screen and in print. During each of the two TYPO TALK evenings, three type designers will present their work. Each will use the example of one of their typefaces to communicate an image of themselves as designers, highlighting their personal ideas and intentions, showing what inspires and motivates them, and allowing the audience as much of a view into their studios as possible. The speakers all come from a variety of backgrounds and include, for example, a Linotype employee, a graphic designer who creates typefaces for his personal work, and a young designer only just beginning his career, but with a few typefaces already available. The audience will have the ability each evening to talk to each of the speakers, and get to know them better. This event is organized by the Gutenberg-Museum Mainz, together with Marcel Häusler, Arthur Ruppel, Alice Schaffner, Daniel Kalbfuß, the Fachhochschule Mainz, Prof. Dr. Isabel Naegele, and the institut designlabor gutenberg. Linotype GmbH is a partner, and Slanted is a media partner. Each event begins at 7pm, respectively. Admission is €3.50.